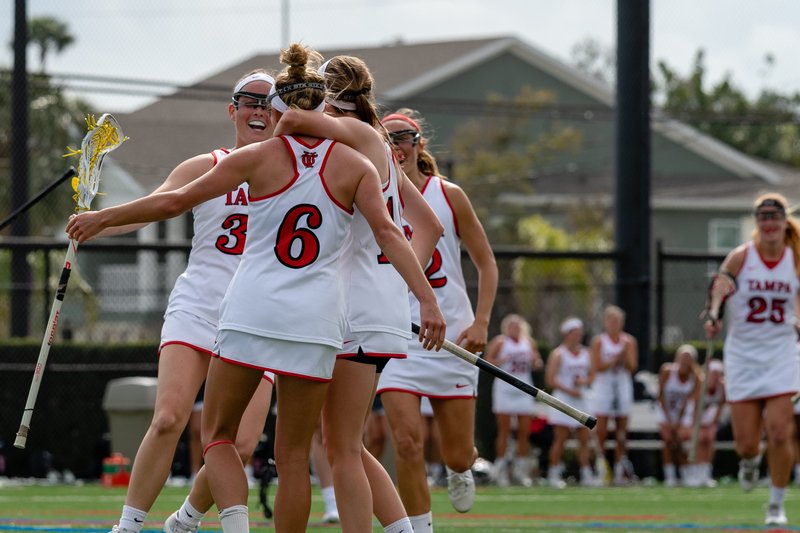 For the first time in program history, the women’s lacrosse team upset the number three ranked Florida Southern College by a final score of 16-14 on Mar 27. Not only this is the first win over the Moccasins, but it is also the program’s first win over a top-five opponent. During the first half, only five minutes into the game, the captain Claire Swanson, junior midfielder, scored the first goal of the match of a free position shot. The Mocs then answered the goal back thirty-seconds later. However, Rachel Crawford, senior attacker, netted an unassisted goal for the Spartans, before FSC tied the game at two. However, the Spartans scored the next seven goals in a row, giving UT a lead of 9-2. With only 4:45 left in the first half, the Moccasins ended Tampa’s scoring run. Caroline Forester, senior midfielder, earned her second goal of the match only 24 seconds later. Heading into halftime, the Spartans led the Mocs by 10-5. Starting the second half, the Mocs were the first team to score, narrowing the Spartans led 10-6. The game had no goals until 21:57, when Kayla Kosubinsky, sophomore midfielder and defender, netted the first goal of the second half for the Spartans. After two goals for the Spartans, the FSC scored seven goals in a row, tying the game at 13. However, Crawford responded the Mocs with a goal, ending their scoring run and giving Tampa the one point lead. Vaccaro and Swanson scored two more goals, helping the Spartans in their winning. The last goal of the game was from the Mocs, finishing the match with a final score of 16-14. As of April 1, after upsetting the Mocs, UT’s women’s lacrosse team was ranked number six best team in the nation, according to the Intercollegiate Women’s Lacrosse Coaches Association (IWLCA). This is the highest IWLCA rank for the Spartans in the program’s history. Unfortunately, for the Mocs, because of this loss, they dropped their third position to the eighth, with only three points of difference from Tampa. The next match that the women’s lacrosse team will be playing will be a conference game against the PBA Sailfish at home, at 1 p.m.